This example demonstrates a simple method for how to register a SIP account to a PBX with your Windows Forms/WPF Application written in C#, that can answer the incoming calls and send the camera picture and voice to a SIP video phone automatically. To implement this example, you need to have OZEKI Camera SDK installed, and a reference to OzekiSDK.dll should be added to your Visual Studio project. 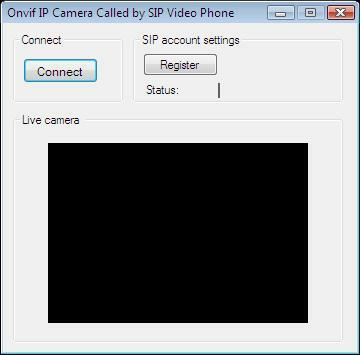 How to call an Onvif IP camera from a SIP video phone using C#? ISoftPhone _softphone: Please create a softphone object from the ISoftPhone interface. IPhoneLine _phoneLine: You should create a phone line object from the IPhoneLine interface. _softphone = SoftPhoneFactory.CreateSoftPhone(5000, 10000): You should also initialize this softphone with the default parameters. Please set the port range indicated by the first two parameters as the minimum port's and the maximum port's number, this is the port's interval. If there is any firewall rule which restricts the usable ports, you can set the usable port range here, which will be used during the calls. These are sample ports only in the example, but a softphone with these parameters can be used in most of the cases. How to listen to incoming calls? Finally the call will be completed. Then you need to unsubscribe from the event. This works similarly to the subscriber (with the "-=" operator) and "disconnector" method, which close the connection between the two media handlers with the Disconnect() method. After the successful implementation of the functions and the GUI elements, the application will work properly. Pressing the connect button will load in the image of the IP camera device connected to your PC into the panel that you can see on the picture. Besides this you can register to a PBX and receive incoming calls to send the picture and voice of the camera. The registration was unsuccessful. Why? Please make sure your PBX is configured properly.